Discover SCUBA Discovery, Scuba Discovery or just Try Diving. Is a non–certification level diving experience. And is designed as a Try out of SCUBA Diving for everyone who like to do so. Or for People which are not sure to take the full SCUBA Course yet. After some theory and some basic diving skills You can go diving with a Dive Professional. Discover SCUBA Discovery, Scuba Discovery or just Try Diving. Is a non–certification level diving experience. And is designed as a Try out of SCUBA Diving for everyone who like to do so. Or for People which are not sure to take the full SCUBA Course yet. After some theory and some basic diving skills You can go diving with a Dive Professional. If you decide to continue to a Open Water Course, one (1) of your two (2) open water dives out of your Discover Scuba Diving Program, get counted as credit for your Open Water Diver course. How Discover Scuba Diving Programs work? After your first Discover Scuba Diving Dives you will have time to Relax on the boat. Having lunch and some drinks before it is going to your second dive. Which will be a normal fun Dive without any skills. Just Relax and enjoy the amazing underwater world of koh Changs tropical warm waters. 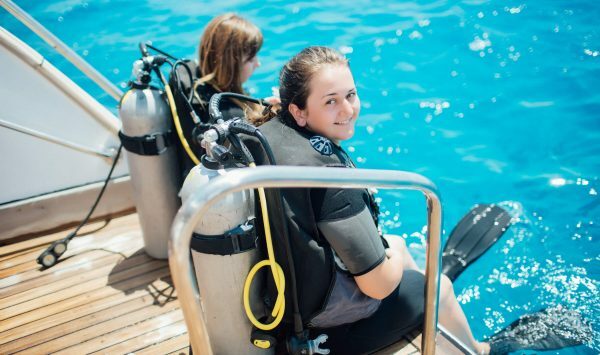 The Discover Scuba Diving Program is the perfect start if you are not completely sure if you are able to take, or if you not have enough time for the full course.